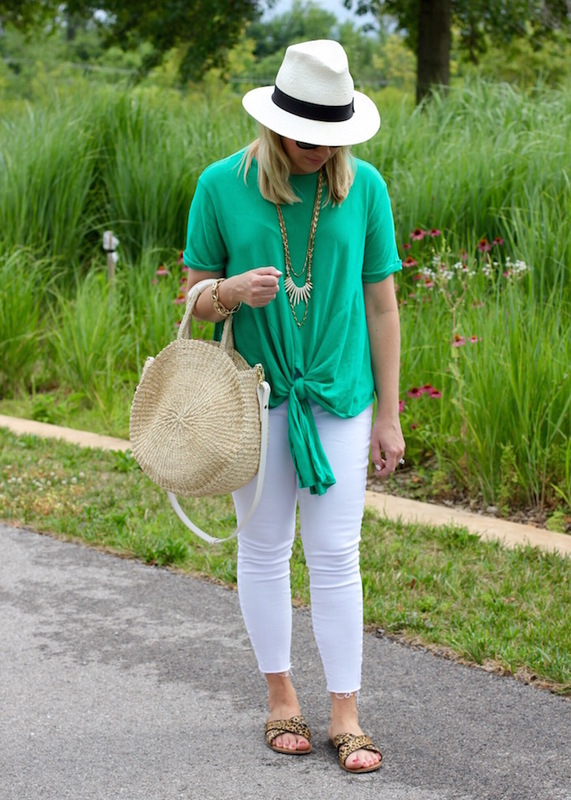 Top:Nordstrom (ON SALE!) 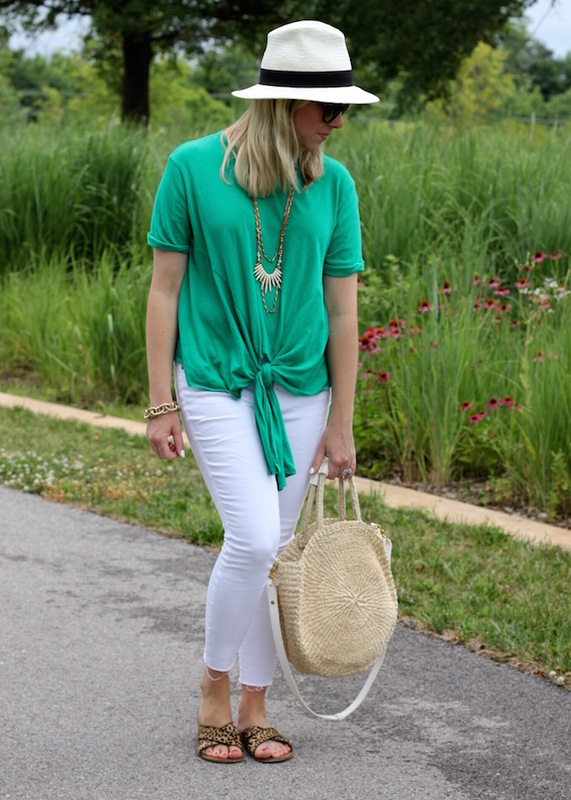 Jeans:LOFT Shoes: Shop similar HERE // HERE Bag:Clare V.
Hope you had a great 4th! We had a relaxing day by the pool and ended it with fireworks. I can't believe the weekend is already almost here! Spotlight: Our spotlight of the week is Karen of Lady In Violet! This navy blue dress is just perfect on Karen! The ruffle details are a fabulous touch! Such a fabulous summer look! This tee is adorable and love your slides. This color is beautiful on you! I love it paired with white pants too! Cute! That tee is so cute! You look gorgeous in green! Great color! I'm in love with your bag too! That color is perfect, Jacqueline!! What a perfect summer outfit! 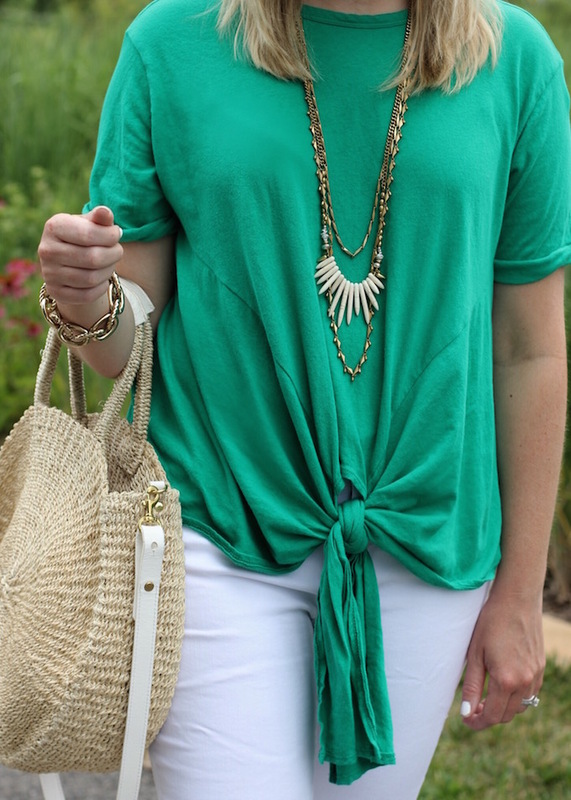 Adorable knotted tee and bag! I featured Lady In Violet today, too! Love that pretty green tee, lady! Happy Thursday! Such a cute tee shirt! I love how the knot part is lower and longer and I like the looser fit! I love this tie front tee, and the color looks so pretty on you! Glad you had a great 4th! This tee is great! I love the color and tie front and detail. Perfectly styled too! I am a sucker for anything with knotted or tie front details. And that top is a gorgeous green! Loving every single piece of your outfit! I'd buy everything! I love the hat and your sandals. Such great accessories. Love the top too! Such a fun tee! Love the tie front with your cute leopard sandals. Such a cute look!! I love your slides!! I can't get over how gorgeous this color is! Love the knotted front detail too! Super comfy and stylish look! love your tee!